Here at Dr. King Scott’s dental office, we offer a variety of choices when it comes to restorative dental work. One of our most popular choices is porcelain crowns. This restoration allows us to restore health to a damaged or decayed tooth while still allowing it to blend seamlessly with your smile. If you have a tooth that is cracked, broken, decayed or worn, it’s important to restore it with a porcelain crown. 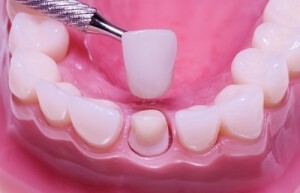 A crown fits snugly over your tooth like a cap to help restore strength and protect your tooth against further damage. It will also help to keep your bite in proper alignment. Porcelain is a great choice of material for your crown restoration because they’re carefully color matched to resemble the rest of your smile. No one will be able to tell that you’ve had any dental work performed. Also, this material is durable and long-lasting, so with proper care and maintenance it will last you a long time. If you have a tooth that’s suffering from damage and decay, don’t put it off any longer. Give us a call today so we can get started on your porcelain crown. This is an important restorative dental procedure that helps keep your smile healthy.